Venture across the Atacama Desert in search of the natural phenomenon that is the El Tatio Geyser. The geyser field sits in the Andes Mountains at more than 14,000 feet (4,320 meters) and puts on a performance for onlookers. See the sunrise in the geothermal field and then head to the Machuca settlement to learn more about the daily life of residents in the driest desert in the world. 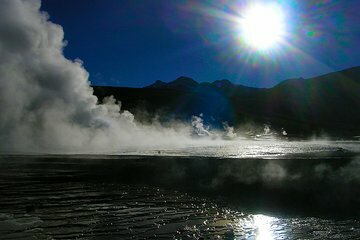 El Tatio sits at an elevation of nearly 14,000 feet, which may cause altitude sickness for some; it is recommended that you drink plenty of hot tea or water prior to the tour and carry any necessary medication. Night before the excursion light dinner, without red meat and without alcohol. When we checked in to our hotel we had a note from the operator to say we would be picked up at our hotel at 5.30am. We were surprised when another operator called at the hotel at 5.10 am to collect us, so we hastily joined them. No explanation. When we returned to our hotel after the tour there was an envelope waiting for us from the tour operator who collected us advising that we would be collected at 4.30am that morning - a bit late to receive the note after the tour, but fortunately we didn't get in before the tour or we would have waited from 4.30am to 5.10am.Not very good planning all round and never an explanation from the original operator about the change.Anyway - large bus. We were the only English speakers, but fortunately we had a good guide who we had been with the day before and made sure we understood everything. Tour basically did what it said we would do.Note: 1 they say it's cold at the geysers and they are right. November and minus 5C. Of course it warmed up quickly.2. The geysers are more steam and bubbling so don't expect geysers that shoot high into the sky.3. The roads to the geysers are bumpy and poor.4. The entry to the geysers is 10,000 pesos ($20) which isn't included in this tour price.End of the day the geysers are worth visiting. I picked this operator because I thought we would be a smaller group - I didn't realise I would be passed to another operator who I could have booked with in the first place.